The weather is warming up in Central Illinois and the golf courses are filling up with players. Here at The Clubhouse, we want you to experience all the great outdoor courses that the Peoria Area has to offer. We also want you to play your best while you are on the course enjoying the warm weather! This Spring is a perfect time to stop down at The Clubhouse and find out exactly how far you hit each club. 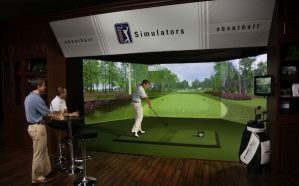 Our state of the art aboutGolf Simulators can tell you exactly how far you hit every shot down to the yard. Along with playing over 70 courses world wide, you have the option to hit our “range” where you can dial in your yardages before you play the links outdoors with your friends. Have you seen the tracing technology on the PGATOUR? We can set up the simulator to “trace” your shot. You will easily see draws and fades, or even slices, duffs, tops, hooks, and the dreaded S-word! Come on down to The Clubhouse and work on your game!